Silvia Kolbowski, That Monster: An Allegory, 2018, looped HD video, black and white, sound, 18 min. In a body of video work produced over the past decade, Kolbowski has explored strategies of 're-animating' the past to pose questions about politics in the present. In That Monster: An Allegory (2018), she returns to the genre of silent film and Mary Shelley's fictional tale of man-made monstrosity, prompting such questions as: how are political and psychic subjects formed now? What does art offer by way of intervening in the mass politics and mass media of today? What forms of resistance are possible? 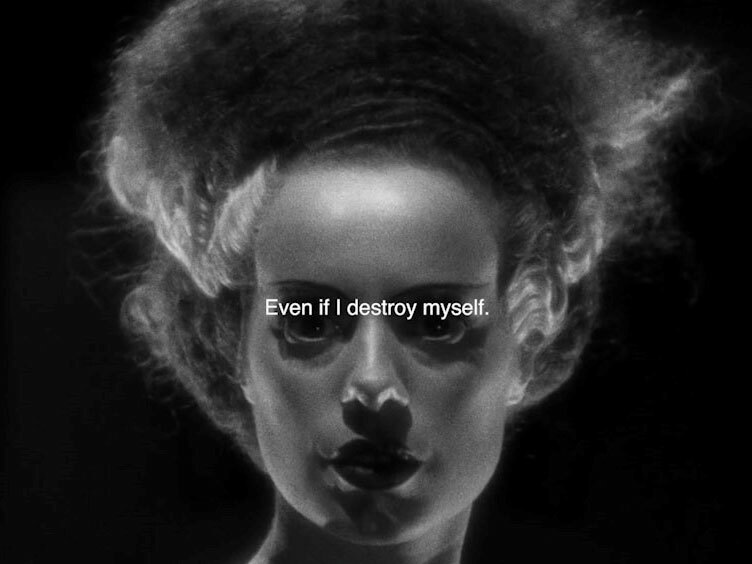 That Monster: An Allegory features re-edited images and sequences from the classic horror film The Bride of Frankenstein (Dir. James Whale, 1935). In this screening, the looped video will play once with sound and once in silence. A conversation with the artist and academic Mignon Nixon and curator Kari Rittenbach accompanies this screening with an opportunity for audience questions. Silvia Kolbowski is a New York-based artist working with time-based media, whose scope of address includes questions of historicization, political resistance and the unconscious. The structures of spectatorship – psychical and political – are a central concern of all her projects. Her work has been exhibited in many international venues and contexts, including The Tapei Biennial; Villa Arson, Nice; The Whitney Biennial, New York; Hammer Museum, Los Angeles and others. Solo exhibitions have taken place at the Museum of Modern Art, Ljubljana; the Centre for Contemporary Art, Warsaw; Secession, Vienna; and LAX<>ART. Mignon Nixon is Professor of Modern and Contemporary Art at UCL and a co-editor of October. Her current book project is Sperm Bomb: Art, Feminism, and the American War in Vietnam. Earlier publications include Fantastic Reality: Louise Bourgeois and a Story of Modern Art and the Eva Hesse and Mary Kelly October Files. She has published critical essays on artists including Nancy Spero, Yayoi Kusama, Carolee Schneemann, Yvonne Rainer, Louise Lawler, and Silvia Kolbowski. Her most recent publication is 'What’s Love Got to Do, Got to Do with It? Feminist Politics and America’s War in Vietnam,' for the exhibition Artists Respond: American Art and the Vietnam War, 1965 – 1975 (Smithsonian American Art Museum, 2019). Kari Rittenbach is a critic and independent curator based in Brooklyn, New York. Her writing has appeared in Artforum, Frieze, Flash Art, May Revue, Mousse, Texte zur Kunst, and in artist books and museum catalogues. Recent projects include 'Coming Soon' (Fondazione Sandretto Re Rebaudengo, Turin, 2018), 'What Everybody Knows' (Svetlana, New York & Jenny's, Los Angeles, 2017), 'Trees in the Forest' (Yale Union, Portland, 2016) and 'On Limits' (The Kitchen, New York, 2016).